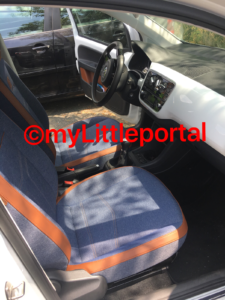 City Car - VW Up! WTF! So the UP is a city car, a car designed for the city of course and what this really means, who knows. It’s not super small and seems to have a little less interior room that the Audi A2 we normally roll around in on our DE vacation. It’s seems to be well made inside, of course you get the ice cream box plastics but the vertical side of the dash is covered in a nice piece of solid shinny plastic that adds a nice touch of fun to the black somber VW interior. The boot is postage stamp sized of course BUT get this the bloody thing comes with park sensors, WOW now their’s a concept. Why not make those things standard in every car! They are optional most of the time it seems in the US and most people have never heard of them but I think after a backup camera they are in the top 3 useful tech items we should all have on a new car. You can actually buy a Bosch kit on Amazon for $200 that is probably the same brand that most cars use but you’ll need to drill into your rear bumper to install the bloody thing so it’s quite a pain in the end. There is also the usual VW radio nastiness with no Bluetooth but only an old AUX jack from. 2008 – Christ, come on a Bluetooth chip is probably only $5 in bulk, put it in all your blood radios VW! We only got up to 140Km/h and it seem to ride well and was quiet as much so as the Audi A1 we normally ride around in while in Germany. My theory is that all cars in Germany sound quiter as the road material is less course than in the US, heck it’d better be if it’s designed to have you fly by at 300KM/h. Overall not too bad of a car and for 12K Euros it’s probably nice than the cheapest car in the US as of 2017 the Nissan Versa Sedan for $13.3K. Previous Previous post: Tmobile – free European data plan is not too shabby!